A day by day look at Miami, Florida. This is just a simple shot of NW 1st street in Downtown Miami, taken from the Metromover, at about 6:00 PM, an hour past quitting time for the mainly-business oriented core of the city. 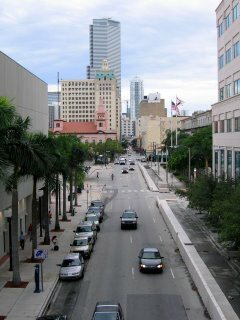 To the left is the Downtown campus of the Miami-Dade College, and in the distance is the Brickell Financial District. Most of all I just liked the perspective and sense of depth the higher ground afforded me. Nice view and well composed. Helping you take the trip of a lifetime, today! I live in Miami Beach but hail originally from Puerto Rico. I like to play roleplaying games, travel and ride my bike.